The Freedom From Religion Foundation is protesting religious decals on patrol vehicles in Kansas. The Harper Police Department has placed a decal on the back of patrol cars reading "Romans 13:4." The New Testament verse in question reads as follows: "For he is the minister of God to thee for good. But if thou do that which is evil, be afraid; for he beareth not the sword in vain: for he is the minister of God, a revenger to execute wrath upon him that doeth evil" (King James Version). Displaying a decal referencing this ominous Christian threat violates the Establishment Clause of the First Amendment, FFRF contends. "The Supreme Court has repeatedly recognized that the First Amendment 'mandates governmental neutrality between religion and religion, and between religion and nonreligion,'" FFRF Staff Attorney Andrew Seidel writes to Harper Police Chief Doug Murphy. "Placing decals referencing biblical quotes on the back of a law enforcement vehicle fails to respect either constitutional mandate of neutrality." It is inappropriate and unconstitutional for a government entity to display such a decal on its property because it conveys a preference by the Harper Police Department—and by extension, the city of Harper—for religion over nonreligion and Christianity over all minority faiths, Seidel adds. Citizens interact with and rely on law enforcement officers during some of the most urgent and vulnerable times of their lives. When law enforcement mandates the display of a symbol from a preferred religion on county property, not only does it unconstitutionally endorse religion, but also alienates the nearly 30 percent of Americans who are non-Christian, including the almost one-fourth of the U.S. population that is religiously unaffiliated. The Harper Police Department's choice of verse to display is particularly disturbing. Romans 13 begins by claiming, "There is no power but of God: The powers that be are ordained of God." This statement directly conflicts with the U.S. Constitution's source of power: "We, the People." There is also something perverse about referring to "revengers," "bearing swords" and "executing wrath," when the job of the Harper Police Department is to protect and serve, not to mete out biblical punishments or divine wrath. "It's bizarre for the Harper Police Department to go down this road," says FFRF Co-President Annie Laurie Gaylor. "It is inappropriate at every level for a government agency to reference intimidating biblical verses on official property." Spending taxpayer time and money placing religious symbols on patrol cars is beyond the scope of secular government, FFRF reminds the Harper Police Department. 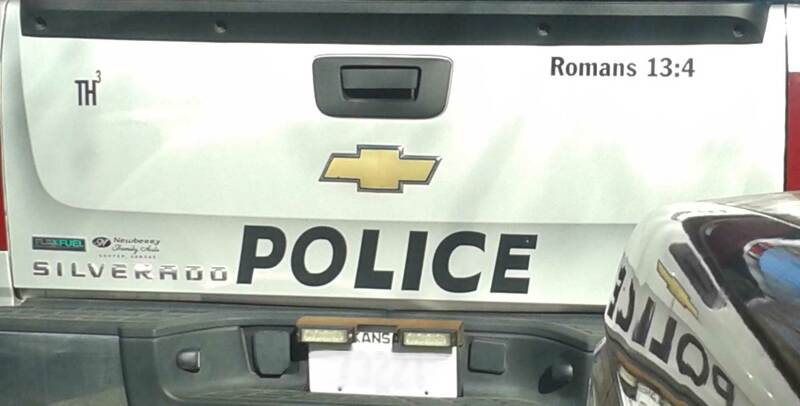 It requests that the Romans 13:4 decals be removed from police vehicles, and that the department inform FFRF in writing of the steps it intends to take to remedy this constitutional violation. FFRF recently settled a lawsuit with nearly identical facts against the Brewster County Sheriff Department in Texas. That sheriff put crosses on vehicles, ignored FFRF's letters of complaint, and ended up losing a lawsuit, costing the county about $20,000 in attorney fees. FFRF is a nationwide nonprofit organization dedicated to the separation of state and church, with almost 24,000 nonreligious members across the country, including nearly 150 members in Kansas.